We're off to Bali for the next nine days, where I will finally be deprived of even my Internet access :'( . Hopefully in exchange for wild times at the beaches and rivers of Indonesia, assuming the rainy season does not take its toll on us. Here in Singapore, I've partaken of the two Singaporean pasttimes: eating, and shopping. 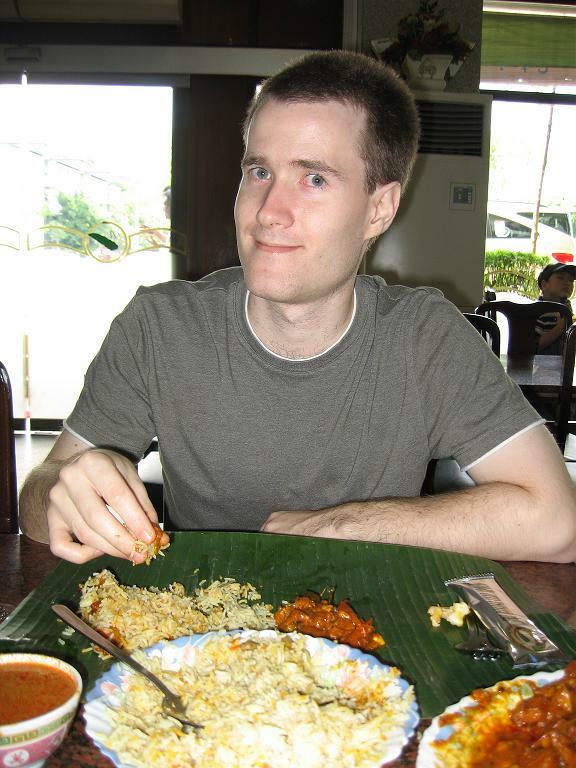 Pictures should come soon of me enjoying my banana leaf food (update: pic), chicken bryani, among others. Even a pleasant eight-course meal at the Singapore Swimming Club*. We've done the club circuit, visiting the Singapore Cricket Club, the Raffles Sailing Club (now THAT is a yacht club... it's like a self-contained resort! ), and the Tanglin Club. Needless to say, we had several refreshing pints of Tiger Beer at each location. Not much else to tell. Back in a couple of weeks! Postcards will go out soon I hope.